Where can I buy Duskin Apple Juice? I prefer online shopping, do you sell it this way? There are a number of online shops stocking the juice - I think they all have minimum order quantities so it is worth comparing this as well as price, delivery etc. 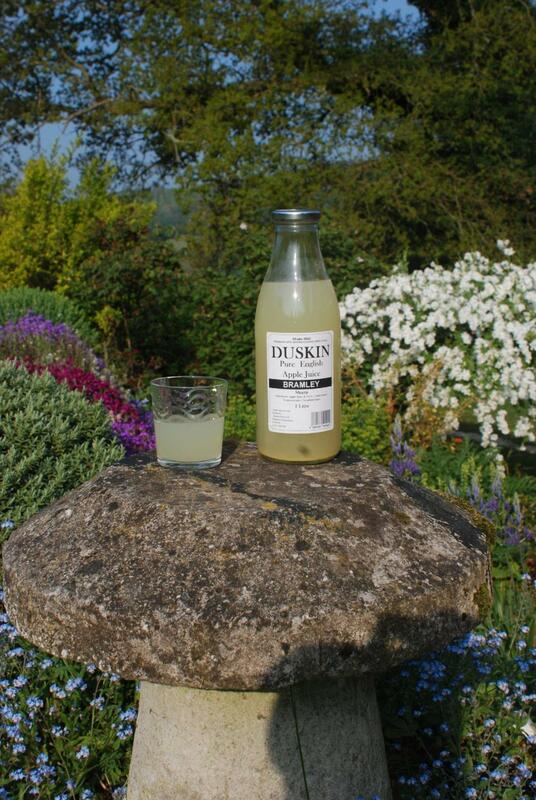 I have a shop/restaurant and would like to stock Duskin Apple Juice - where can I get it? Do you add sugar to the juice? How long will it store for? As a guide, the juice will keep for several months while the bottle is sealed but we always put a best before date on the lid of the bottle and this is the best guide for individual batches. Why is some juice more cloudy than others? We make apple juice in many different varieties and each one has its own character, some more cloudy than others. Also, we do not filter our juice or treat it in other ways to make the juice clear or to standardise the look and flavour. The cloudiness in the juice is due to the naturally occurring pectin in the apples and the levels of this can vary with different growing conditions as well as different varieties - just as wines can vary in different years. One thing I would say is that cloudiness is only a small part of the differences between varieties. We label our bottles to give an idea of how sweet or sharp they are but it does come down to personal taste. Do you sell to supermarkets? No we do not sell to any of the big supermarkets and never will. Instead we cover the whole of the UK by supplying small independent shops. We very much prefer it that way! Can I return the bottles to you to recycle? As far as sending back the bottles for re-use goes, it is not something that we do any longer. When we started, back in 1980, we did take back empties and re-use them, but we found that it took so much time and resources to transport them back to us, check for damage, wash, dry and sterilise before re-using them (not to mention problems with breakages) that we had to stop. It has become so much easier and more efficient for everyone to recycle glass from home to be dealt with in bulk that we decided that would be a better way forward. Of course, they do also make good storage jars at home and I have even seen them decorated and used as candle holders to great effect. Do you have Point of Sale material that I can put in my shop? I am doing an A-level project on Enzymes in fruit juice production, do you use them? We process our apple juice in quite a different way from most producers. What we do is simply crush the apples, squeeze the juice out, let it settle, and then put the juice in bottles. I'm sure you will find from your research that other companies use Cellulase to increase yield and Pectinase to give a clear juice - we feel these can also denature flavour molecules and we prefer the look of natural juice anyway. A point which links to this is that many producers are trying to make a uniform product, which always looks and tastes the same (hence the use of enzymes). We do not want to do this, we press individual varieties and want each one to be true to itself - some varieties have lots of pectin and are cloudy, some have less and are clear. It also varies depending on when the apples were picked and what the weather was like as they were growing. Our customers like this variation and the idea of a natural product. One other point not to forget is that there are many natural enzymes in the apples themselves - It is the natural enzyme controlled cell processes which create the flavours in the first place. Can you recommend a variety? The best thing to do if you can is to try a few and see which you like the best, if you have a favourite apple for eating then that would be a good place to start. Our juice is not made from organically grown apples. We get them from a group of Kent orchards and you may find more information on their website and I'm sure they will be happy to answer any queries if you get in touch with them. One thing I would say is that they use as few treatments as possible to make sure the apples have low levels of disease. I know this is a fine balance to try and get right and I hope you are happy to continue to enjoy drinking our juice.